Sibley Park in Mankato, Minn., recently opened its new farmstead-themed playground. The playground is installed next to Sibley Farm, a petting zoo complete with alpacas, calves, goats, peacocks, horses, pigs, lambs, chicks and ducklings, and the playground structures match the red barn-style buildings of the zoo. Our local playground consultant, Flagship Recreation, and our custom design team at Landscape Structures collaborated with the client to create a one-of-a-kind play area. Using a variety of materials, they created two barn-themed playstructures, a chicken coop structure, pig pen, tractor climber, corn stalk climbers, a wagon-themed seesaw and much more. 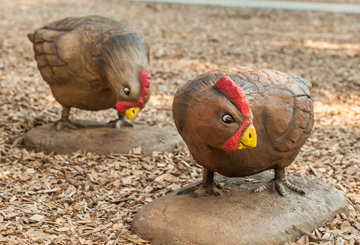 What makes the playground come alive are the farm animals—chickens, coyotes, horses and pigs—sculpted from concrete and hand painted by our team of artists. The new farmstead-themed playground has quickly become a destination play space for communities surrounding Mankato. Kids and families visit the playground regularly to explore and play. Check out the below video of the playground in action, then see if for yourself at 900 Mound Avenue in Mankato. 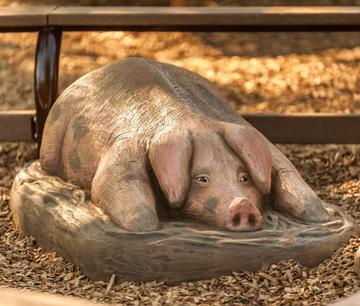 This entry was posted in Custom, Design, Playground, Theme playground and tagged Farm, Farmstead-theme, Mankato, Minnesota, Sibley Park by PlayLSI. Bookmark the permalink.